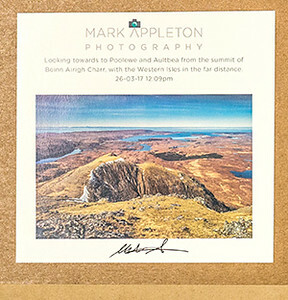 If the artist supplies a label with information about their artwork we will, if you wish, add it to the back of the frame as shown in this example. Note that sometimes artists stick labels to the back of their artwork. This is not recommended as self adhesive labels have chemicals in them that may eventually penetrate the artwork leading to discolouration.